just want to know is there any sample to use object like List<object> as data source? Please refer the attached application where FlexReport is bound to a list of objects. Hope that helps. but I have few more qeustion about this sample. if so , how can I get master-detail report useing List<object> and object.List<subobject> ? Please try to implement the IC1FlexReportExternalRecordset in your custom class and return the data to data source as per your requirement. 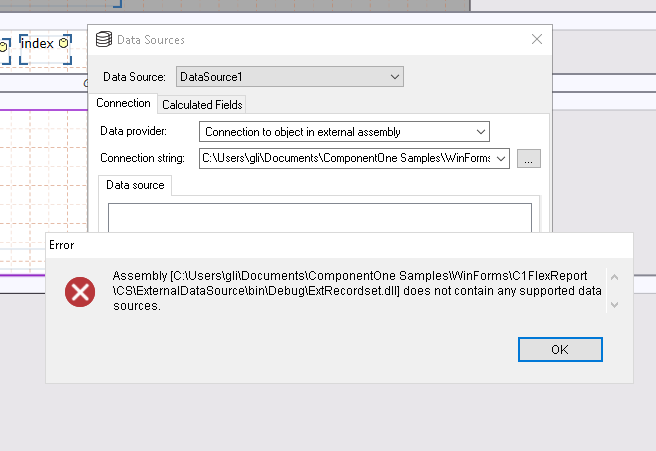 I tried with the exdatasource.dll in this sample, but I get the sample problem, it said no supported datasource. is it because I use the UWP version? also , I have gone through the code, it looks too complex for a simple external datasource? can flexreport using object from IEnuantor or IList that is much simpler? "is it because I use the UWP version?" Since "ExtRecordset.dll" is a WinForms dll and the FlexReportDesigner is a WinForms application, you can use this dll with the application without issues. However, your requirement is to use IList in a UWP application, which can only be done in the code behind (and, not by using the WinForms designer). Please let me know if you have any additional questions on this. the problem is the designer , I want to heve field in designer so I need pass the field name from external dll, I tried you sample , but get the screenshot I sent in the design as above. why it is not working in my end? I use the designer installed with flexreport UWP. I am using the cq flexreport designer, maybe that is why the dll not supported? but I need using flexreport designer as I need show in UWP. C1FlexReportDesigner works fine at my with the "ExtRecordset.dll" assembly. You can find a C1FlexReportDesigner application at "Apps\v4.0" location after extract the file. It still not working in my side, but I am not concern it now, I can use the database table in design and pass the object list in runtime. I have code to return the subreport1.subreporthasdata and it returns true. I tried your code, however I still get the same error after 3rd subreport as before? I escalated this issue to developer team. Will let you know as soon as there is any information from them. this is very important feature that we have to get it fixed before we make decision to purchase. we have approved the purchase order but this is now on hold due to this problem. can we get this fixed ASAP? This is in developers' to-do list. We have raised the priority of the issue. Will let you know once there is anything from them. We are happy to let you know that the issue has been fixed now.